In 1994, Sol Kerzner purchased a languishing Resorts International from entertainer/entrepreneur Merv Griffin. This once-popular jet-set playground on Paradise Island had seen better days, but from the start Kerzner saw its potential. Struck by the beauty of the location, on a lush tropical island with a pristine two-mile white sand beach, Kerzner vowed to build the most engaging and astounding resort the world had ever seen, a place where dreams would be made real and all who experienced it would fall under its mystical spell - whilst having a whole lot of fun in the process. At that time, tourism, the largest sector of The Bahamas' economy, had been on the decline, unemployment rates were in the double-digits, and the country's tourism infrastructure had been steadily eroding for years. But that was all to change quickly as, within eight months, Kerzner had transformed almost the entire island into a tropical paradise. From 1994 to 1998, Sol Kerzner created the mythical city of Atlantis from the ground up -- or, more accurately, from the seabed to the skies. 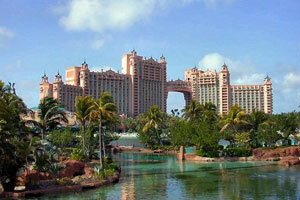 More than $800 million was spent to bring to life the myth and legend of the lost city of Atlantis. The original scope and scale of the project was mind-boggling: the world's largest open-air marine environment of 11 million gallons, home to 50,000 sea creatures representing 200 species; new lagoons and countless waterfalls; a spectacular Mayan Temple Waterslide complex; 6 swimming areas and a $15 million Marina - itself an engineering marvel - that would attract the sleek international mega-yacht set. Following a decade of success, Atlantis, Paradise Island continued its growth as Kerzner International embarked on a third phase of development with its approximately $1 billion expansion in 2007. Adding to Atlantis' existing 2,317 rooms and the world's largest open-air marine habitat, the Phase III expansion includes: the luxurious 600-room resort within the resort, The Cove Atlantis; a 497-key condo-hotel, The Reef Atlantis; a 14-acre dolphin habitat and education center, Dolphin Cay; a 63-acre addition to the waterscape, now called Aquaventure and a total of 140 acres; Aura, a nightclub from the operators of PURE, Tangerine and Coyote Ugly in Las Vegas; approximately 100,000 additional square feet of new conference facilities and a total of over 500,000 indoor and outdoor space creating the largest conference space in the Caribbean; and the 30,000 square-foot flagship Mandara Spa.